Mallorcan food is typically hearty fare, with meats and stews showing up on most menus as well as the popular suckling pig. Being an island, seafood is understandably a common staple, with monkfish and sea bream served up in all manner of sauces. Following the Spanish tradition, tapas (a selection of small dishes) are often served as starters, or as a lighter meal. Eating out in Mallorca, as in the rest of Spain, is an important part of life. Evening meals are taken late, usually after 2100, and it is not uncommon to see families sitting down for a meal at 2230, especially in summer. 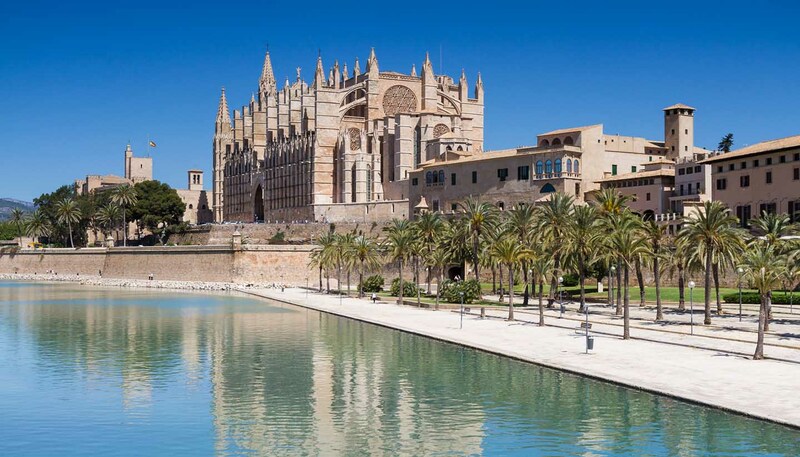 On Saturday mornings, Palma's traditional indoor food markets such as Mercado Olivar and Mercado Santa Catalina are teeming with the city's trendy residents who enjoy fresh oysters and champagne amidst the bustling fish stalls. House wines are usually of good quality and extremely well priced. Local wines such as Jose Ferrer and Macias Batle are excellent. Coca de patata: Sweet bread-like bun made from potato flour and dusted with icing sugar. Sobrasada: Soft, spreadable red chorizo-like sausage, typically spicy. Sopas Mallorquinas: Mallorcan stew made from liver or seafood with vegetables and potatoes. Tumbet: Baked dish of layered potato, courgette, aubergine and tomato sauce. Pa amboli: A snack of bread and olive oil often supplemented by island cheese, jamón (cured ham), or chorizo. Lomo con col: Pork wrapped in cabbage leaves. Parrillada depescado: Mixed grilled fish and seafood platter. Gató de almendras: A very traditional spongy cake made with almonds. Ensaimada: Spiral-shaped cake, dusted with icing sugar sometimes filled with cream or jam. Herbes de Mallorca: Aromatic herby liqueur.